Heat gas or charcoal grill. Brush cut sides of peaches, plums and apricots with melted butter. Place fruit cut sides down on grill over medium heat. Cover grill; cook 2 to 3 minutes or until grill marks form; turn 90°F, and cook 2 to 3 minutes longer to make perpendicular grill marks. Transfer fruit to cutting board; let cool 5 minutes or until cool enough to handle. Cut fruit into wedges. Meanwhile, in large bowl, beat olive oil, honey, lemon juice, salt and pepper with whisk. Reserve 1/4 cup of vinaigrette in container; set aside. Add arugula to large bowl of remaining vinaigrette; toss to coat. Transfer to serving platter. Return reserved vinaigrette to large bowl; add grilled fruit, and toss to coat. 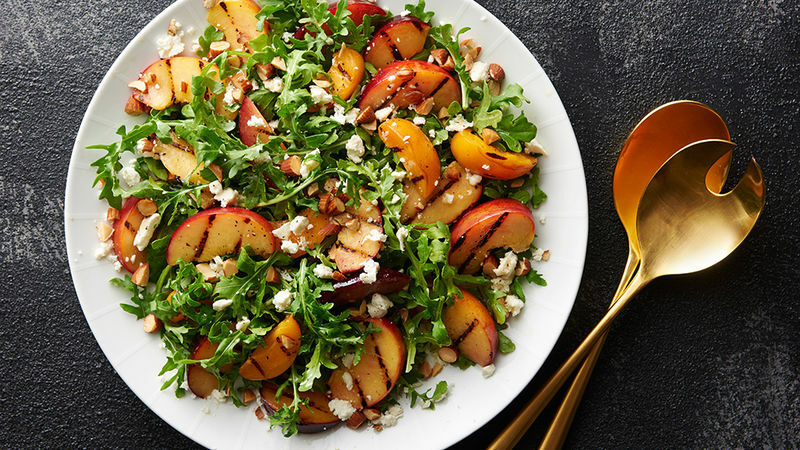 Top arugula mixture with grilled fruit, cheese and almonds. Can’t find each of the fruits in a perfectly ripe state? Feel free to substitute more of any of the fruits for each other. Not a fan of feta? Goat cheese makes a great substitute.